On March 8, 2018, at 10.20 a.m. the "Barbarossa" was caught by the stream when about to berth at the South Pier in Brake. The ship was pushed against the foreship of the bulkcarrier "Loch Lomond" (IMO-No. : 9639464), having sailed from Immingham on March 4 towards the Weser River. Obviously the master misjudged the currents at the Weser bend in Brake, and with the outgoing tide his ship became unmanoeverable. A part of the railing and a basket for ropes aboard the "Barbarossa" were damaged, the damage was estimated to be some thousand Euro. On June 20, 2015, the "Barbarossa" ran aground in the Randers Fjord at Uggelhuse. The ship was on the way out of the fjord with a cargo of iron, which was destined to Bilbao. The grounding caused damage to the ship. After it was refloated, it was allowed to sail to Udbyhøj where it anchored and was examined by divers from the company Seatek, who found damage at starboard side which had suffered a breach of three meters length. The forward ballast tank was flooded. The ship was given permission to sail to Grenaa for further surveys. It sailed on June 22 at 6 p.m. and berthed at 7 p.m. In Grenaa the cargo was to be transshipped and sent forth. The "Barbarossa" left the port of Grenaa after having unloaded its cargo on June 24 at 1.45 a.m. and headed to Klaipeda for repairs, ETA June 26. 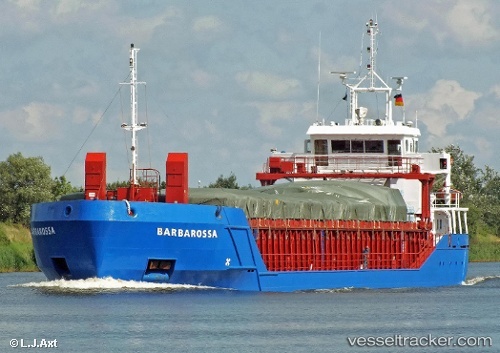 On Sep 25 2011 at around 0530 LT general cargo vessel Barbarossa suffered engine failure while passing Dardanelles. Tug Kurtama 4 was sent to distressed vessel, at 0830 m/v Barbarossa was secured in Karanlik Liman.